A little bit goal setting, to-do list, life coach, and cheerleader, the Everest – Live Your Dreams & Achieve Goals iPhone and iPod Touch app helps you make big changes through small steps with a fresh, bright interface and smart, intuitive tools. The Everest iPhone app has a nice series of opening screens to help you acclimate. You can create an account with a Facebook or email authorization. You can establish reasonable Facebook privacy settings with ease in the authorization process. 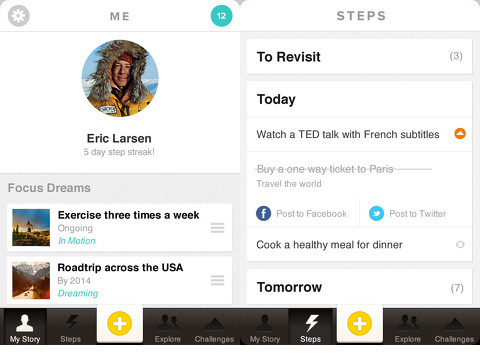 The Everest iPhone app opens to a bright, smart home screen similar to Instagram. The content appears in the main part of the screen, and you navigate with one touch on the icons in the menu bar located at the bottom of the screen. The categories include me, steps, add, explore, and challenges. The me icon leads you to your profile, so you can stay on top of your success. A nice touch is the access to the settings menu from your profile. With a touch on the settings wheel, the screen turns and reveals a list of selections for customization. To add a dream, you tap the add icon. A pop-up with five different selections slides on to the screen; and you can add a step, capture a moment, make a note, start a new dream, and declare a dream real. 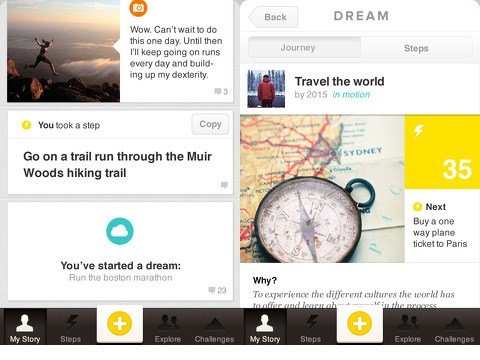 To add a dream, the interface reminds me of Path’s sharing interface. There is a simple, yet thorough pop-up for you to add details, like what, when, categories, sharing, and security. For what, when, and categories, there is complementary interface to allow you to set different timelines, establish ongoing pursuits, and add to the appropriate category. You will like that you can customize fully, yet the tools and functions are efficiently presented and controlled by agile, intuitive gestures. Similarly, to add a step, you can choose to make it repeat, establish a due date, schedule a reminder, and share. For each item you add, you can establish whether it is private or shared with the Everest iPhone app social network with one touch. You can also prioritize your dreams, so you can stay on track and keep organized. There are two feeds that may inspire you to establish and follow through with your dreams. The explore feed is sorted by one touch on the appropriate icon at the top of the screen. You can choose following or everyone. The feed is a list of users, a synopsis of their dreams, and their activities. You can touch an item on the list, and their public profile pulls up. You can sort by their big dreams and steps with one touch at the top of the screen. Users can comment on your dreams and accomplishments–hopefully in an inspiring way like the Chee.rs iPhone app. The challenges feed contains dreams and steps to accomplish curated by brands and well-known figures. For example, there is a cooking dream inspired by Julia Child that you can copy and make your own. The categories include philanthropy, finances, health, personal growth, learning, relationships, and more. The Everest – Live Your Dreams & Achieve Goals iPhone app is simple to use, easy to customize, and helps you set long-term and short-term goals by breaking them down into easily attainable increments. AppSafari review of Everest – Live Your Dreams & Achieve Personal Goals was written by Jenni Ward on January 11th, 2013 and categorized under App Store, Free, Productivity, Social. Page viewed 5953 times, 1 so far today. Need help on using these apps? Please read the Help Page. Hi, my name is Érica and I’m trying to use this app. Unfortunately I don’t have an iPhone and, ’cause it’s so expensive in my country, I can’t buy one, yet. So I started to use this in my computer, but I have no idea how can I create my personalised goal/dream, or even can I create this from browser. Could someone help me? Thansks!